Now what?. I am going to use a couple of colors of water soluble oil pastels around the edges of some of the elements to tie everything together. I added some journaling and painted in some speech bubbles. 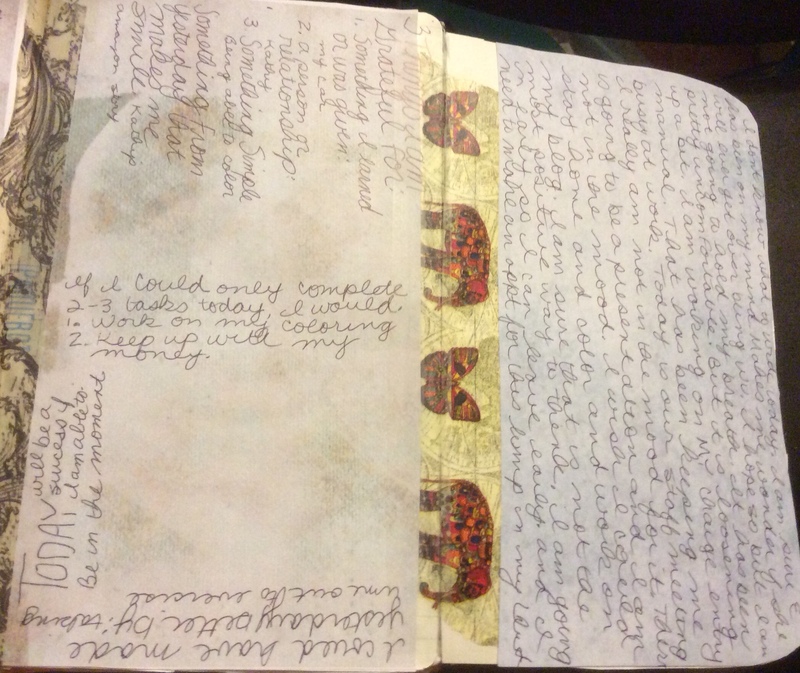 I decided I would probably want to add journaling toward the bottom of the left side of page and the right side of the right page. But there is a problem. I added a lot of water soluble oil pastel and it is almost impossible to use any pen on top of that. There are a few pens that will but even then, some of the pens that have said they would write on anything, still don’t write on the waxy surface. To solved this problem, I grabbed some of my matte medium and brushed some over these areas. This will cover over the waxy residue and make a much easier area to write on. Happy October 1st everyone! Have a GREAT day! 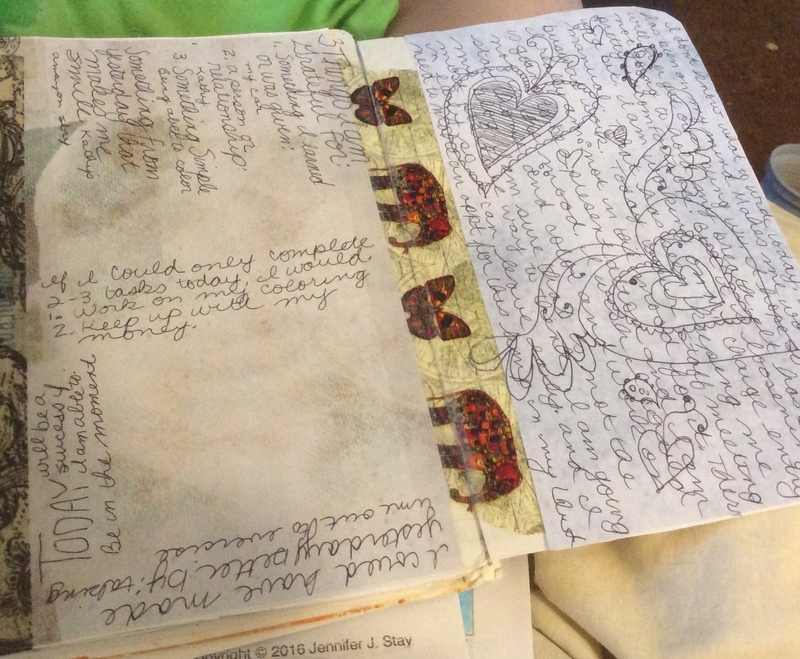 For a long while, several months at least, I have been modifying my art journaling process. 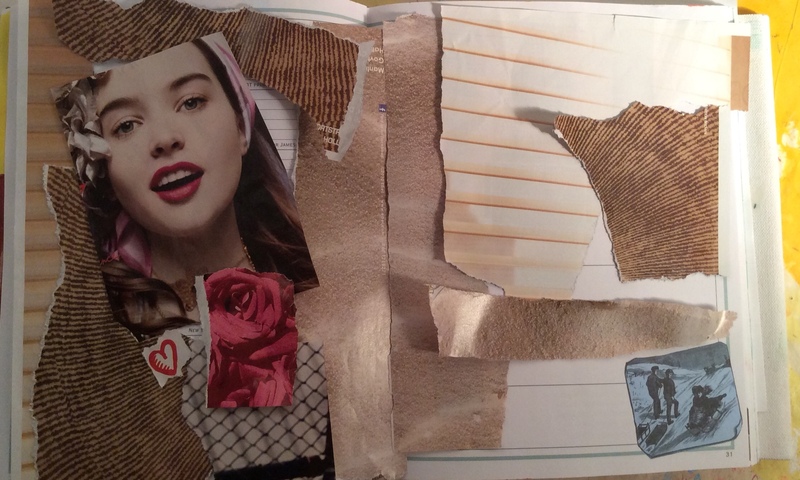 Being limited in time, due to my work schedule, I have been doing my journaling out in the living room – which for the most part makes heavy gluing, painting, and access to a lot of my diverse art supplies really difficult. 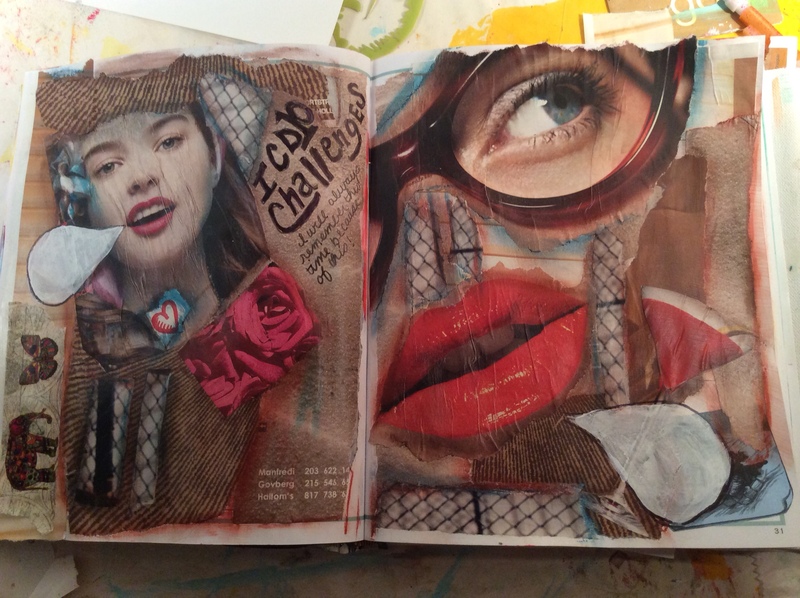 So I have generally been doing light collaging… if any and doodling and pen work. 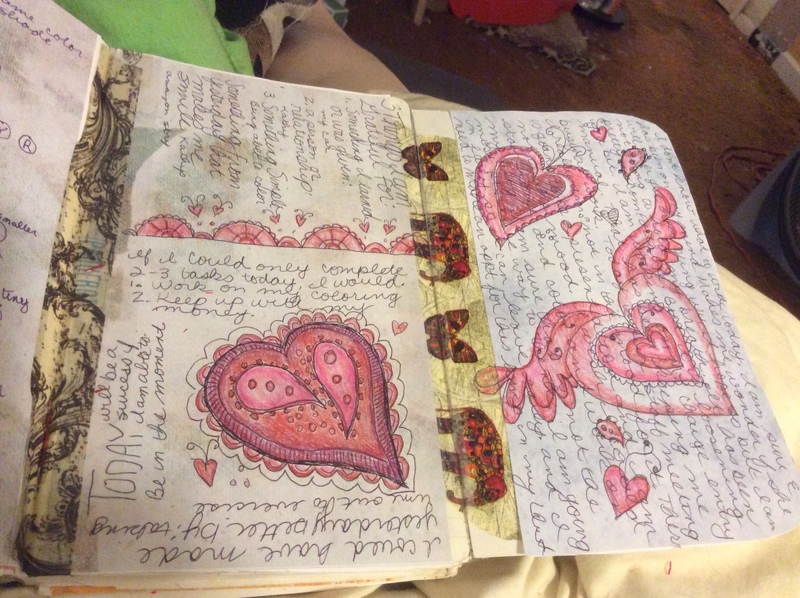 My schedule at work changed, so I recommitted myself to doing a bit of art journaling, in my studio, every day. So I can paint a little, maybe find some collage elements… doodle… whatever. I have promised myself that there is no need to complete a page in one day. Any little bit counts. My purpose will be sharing my daily additions with you. I hope you find the process interesting. Well, this first pic is of a completed page. I actually did this in one sitting. Having a little more time, I was able to glue down all the images and add bits of acrylic paint using a dot stencil. The facing page of the spread is blank and has not been touched yet… I should have included it my photo but wasn’t thinking ahead. 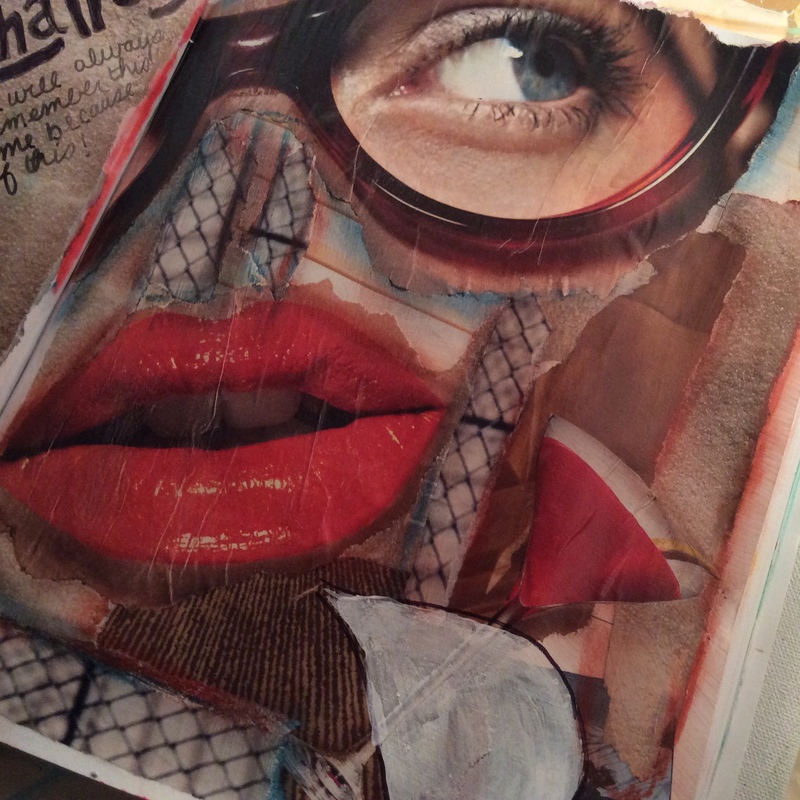 When I started, I had pulled out a bunch of red colored background scraps of paper, I wanted a focal image but I didn’t find anything in my stash that I liked. 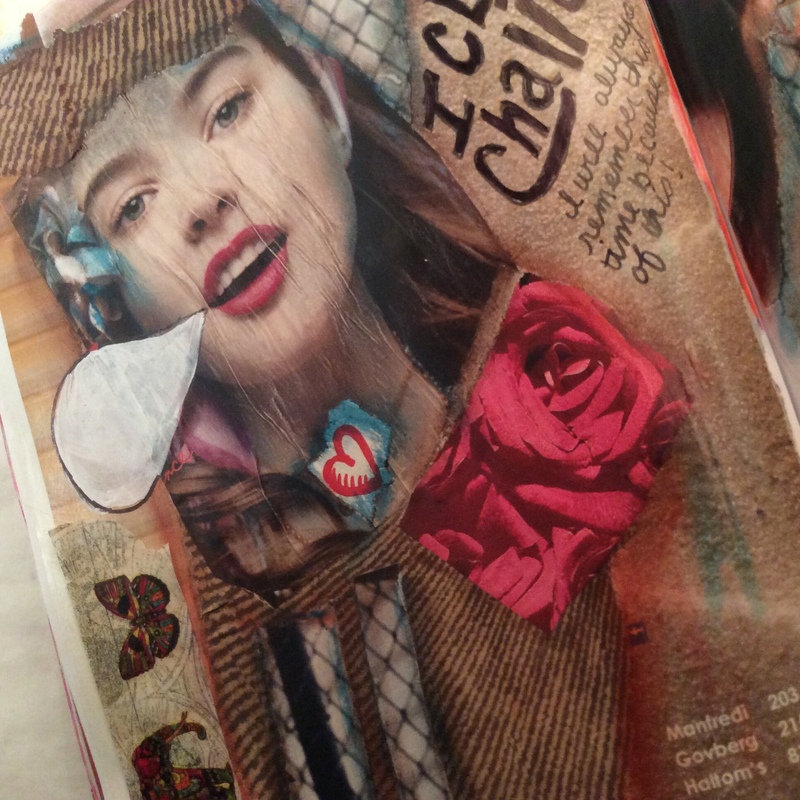 So I grabbed an old magazine, flipped through a few pages and found her… For some reason I liked her flirty little skirt. Not a lot of thought, I cut out the first focal image I liked. Next step was to arrange the background pieces. I added some blue pieces because the focal image had that color as part of its background and I liked the red with pops of blue. 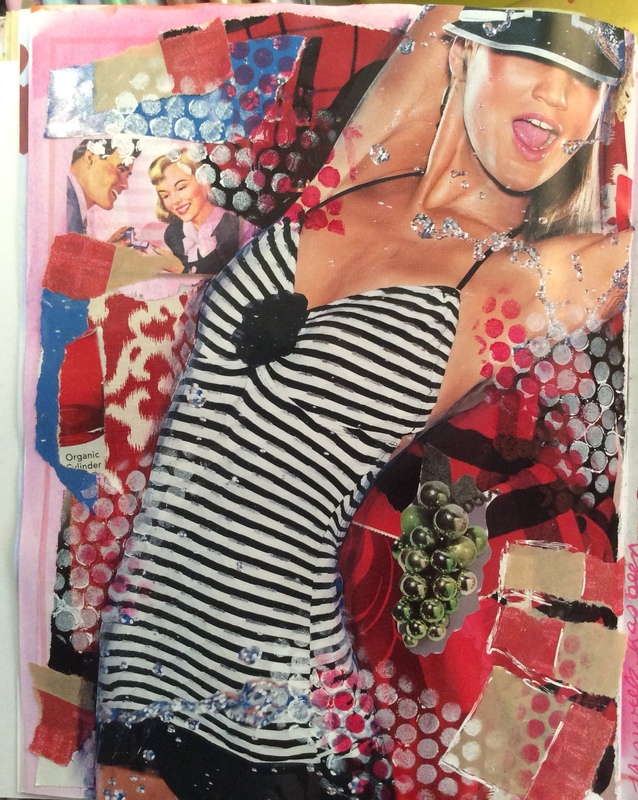 I glued down the background, added the girl making sure I got in her little skirt (and no, I didn’t chop off her head to get the skirt to fit, that is how the image was on the magazine page). A grabbed a water soluable oil pastel and outlined around my girl and smudged it in. 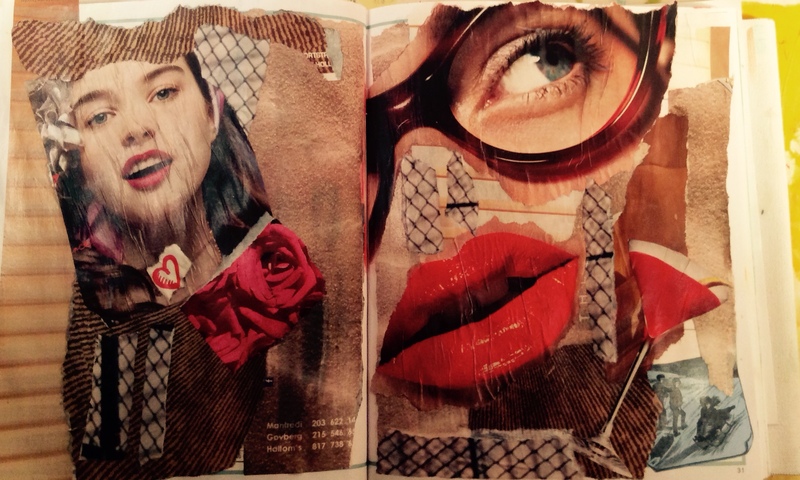 I did this so that she pops out as the main focal image. Instead of a bunch of papers glued to the page looking rather flat, this helps give the page more depth. I added the grapes because I felt it needed something more and I thought the green looked good with the red. Also, it was one of the few decent elements I found in the magazine I had at hand. The circles of the grapes, gave me an idea to stencil circles on the page to integrate everything together. I used white acrylic paint with bits of red paint. 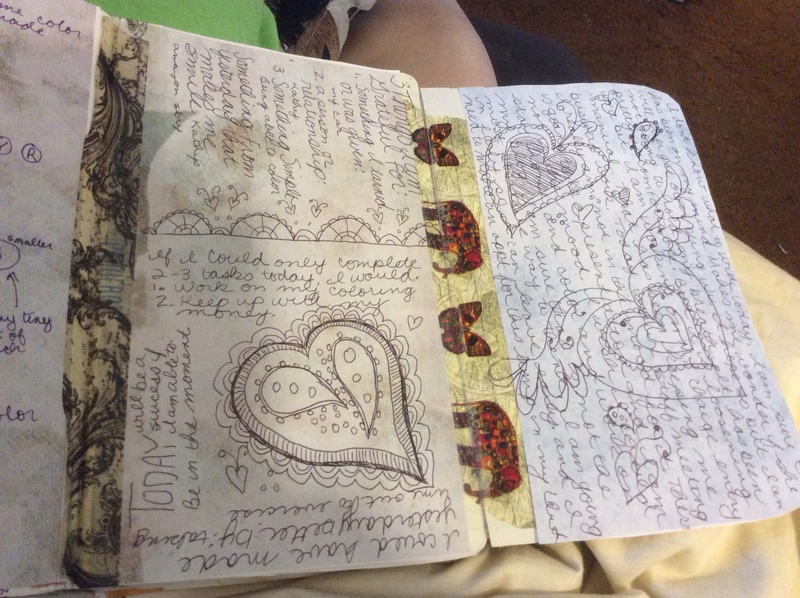 I also added a bit of stenciling to the facing spread page… but silly me, I forgot to take a pic of it.